Esther Howland was born in 1828, the daughter of Southworth Allen Howland, who owned S.A. Howland & Sons. the largest stationery store Worcester, Massachusetts. But it was Esther who really put them on the map. According to the Library of Congress, Esther received a Valentine from England in 1847, the same year she graduated from Mount Holyoke Female Seminary. She loved it, but it seems like that love came mostly because of the aesthetic inspiration it prompted within her. She persuaded her father to put in an order for lace paper and flowers for the store, then put together a few samples of her own for potential cards. Esther then talked her brother Allen into taking the samples on his next round of sales trips for the store. She hoped to get at least $200 in orders and was shocked when Allen returned with $5,000 in advance sales for her Valentines. Esther’s recruited friends to help, and eventually established an assembly line that pre-dated Henry Ford for creating the hand made cards. Victorian Treasury describes Esther’s set up as a long table under a skylight, down which the cards were passed with each person adding their detail before finally being inspected by Esther at the head. Soon, her business, the New England Valentine Company, was making her $100,000 a year and she was outsourcing to cottage industry workers. Past Is Present says that Esther stated her all-female staff was paid “liberally” and that making the cards was “light and pleasant” work, but do keep in mind that this was by the standards of the mid-1800s. Several design innovations are attributed to this talented woman with a creative eye, which set her unique product apart from the competition. Multiple layers, hinged or lift-up flaps, accordion springs, die-cuts or Baxter prints, and heavily embossed flowers - often overlaid for impact - were applied variously to the designs. The folded paper springs enabled the separate layers to rise up, creating a dramatic shadow-box effect. Colored paper wafers set beneath different sections of the lace enhanced the patterns to make them even more visually appealing. Preferring that the sentiment be saved for the more personal interior of the card, she developed separate “Mottos” which could be pasted inside. She even provided dealers with booklets containing 131 different verses, so a customer could select a new one to replace one that did not reflect the senders’ exact intention. 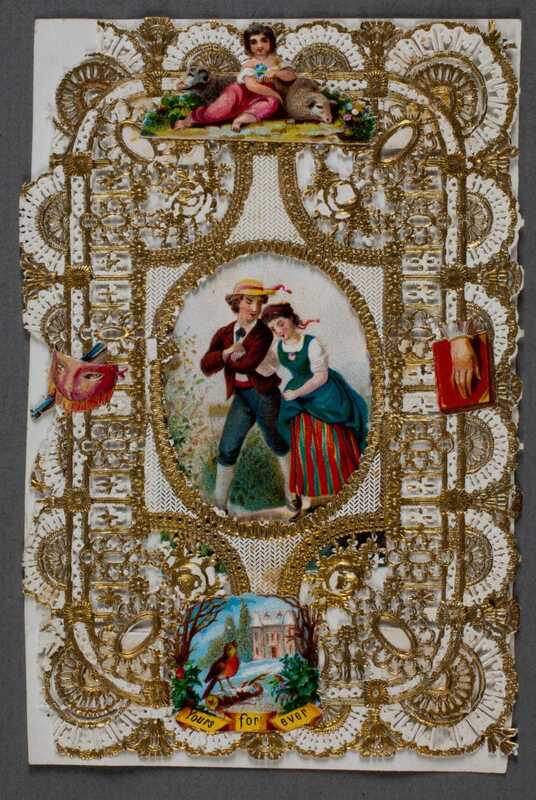 By the time Esther sold her business in 1881, to care for her ailing father, mass production had made the Valentine even more ubiquitous, though far less complex and detailed than Esther’s creations. Upon her death in 1904 she was dubbed the “Mother of the American Valentine.” Though responsible for so many romantic sentiments carefully pasted and sent, she herself never married.